We are delighted that you are considering the Links Functions and Event centre for your special event. This elegant and modern facility proudly overlooks the beautifully maintained and manicured Christchurch Golf Clubs’ Shirley Links, one of New Zealand’s most iconic and premier golf courses. From small intimate business dinners and birthday celebrations to Christmas parties, weddings, product launches and fundraising events, we offer first class amenities in an unrivalled natural setting, all supported by a high standard of service from our professional and friendly team. 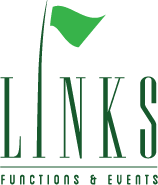 Links Functions and Events is a versatile space that has four separate spaces all located the ground floor. With the ability to retract and expand the rooms via the solid wooden sliding room dividers, we are able to seat up to a maximum of 230 guests. French doors and wall to ceiling windows span one side of the venue accessing a veranda that runs along the greens of the club. Upstairs we have the prestigious Charles Gallery, a sophisticated and elegant boardroom seating up to 15 guests. The state-of-the-art audio visual system has the ability to connect through all rooms or be individually isolated. Ideally located just 10 minutes from the city and only 20 minutes from the Airport, Links Functions and Events is perfect location to get away from it all and get on with business or pleasure.